Framing and focusing dim targets on a camera screen through a slow old school scope like the Questar is hard. 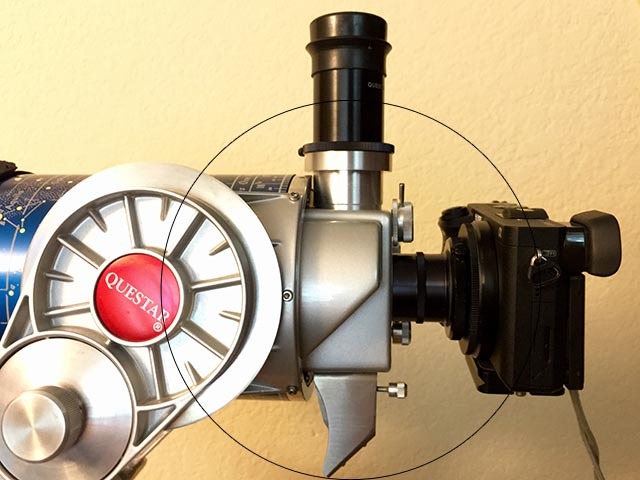 The Questar has the potential to make this easier, because the control box allows you to switch between the eyepiece view and axial camera port view with just a flip of a lever. It’s easy to frame and focus in the brighter eyepiece view. A camera electronic view finder with a magnified view and focus peaking works well for fine focusing, but you need to start out very close to camera focus to see anything at all. Unfortunately, without taking extra measures, the eyepiece view and the camera view can never be in focus at the same time. Even with a short flange to sensor distance mirrorless camera and 3mm T-ring, the camera prime focus is still farther out than the default Questar eyepiece focus. With targets like dim galaxies or nebulas there may not even be a field star bright enough to focus the camera on in the field of view. Stars in the electronic view finder screen are too dim to see unless you are already very close to focus. If you don’t have any bright field stars in your camera field of view you can increase it’s sensitivity by increasing ISO and exposure time for focusing. If you need to find a brighter star to focus on, reposition to focus and then return to your original framing. A Bahtinov mask can make dialing in focus easy on a bright star. If your camera has a magnified focus view and focus peaking, those are very helpful as well. If your main targets are solar system objects and brighter DSOs, you can work around this by focusing and framing your shot in separate steps without any additional adapters. The key to this is to know how many turns of the focus knob separate your eyepiece focus and your camera focus. Measure this on a bright focusing star and remember it. If you have to re-frame to find a good star to focus on, write down the turns for the RA and Dec adjustment knobs to return to your target. Once you have a bright focus star in your eyepiece view you can then approximately refocus for the camera by counting turns of the focus knob. Your view will be bright enough to do your fine focus on the camera screen. Now return to your target by reversing the turns on your RA and Dec adjustment knobs. Even though your eyepiece view is now out of focus, you can usually see the field stars well enough to re-frame your shot. Finally check your framing and final exposure with some test shots with your camera. Then you are ready to shoot. 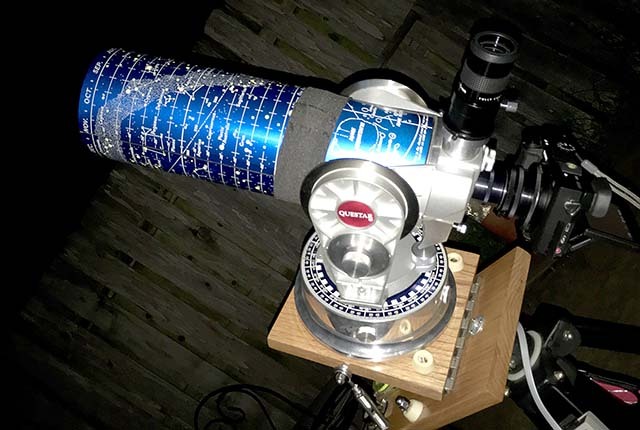 You will want lots of images for stacking with a small scope like the Questar. Remember to check your framing occasionally if your polar alignment is less than perfect. Periodic error limits your longest exposure to about 20 seconds without guiding. The high ISOs possible on modern low noise cameras will bring a lot of targets within your reach with stacked 20 second exposures and careful processing. For both the camera and the eyepiece to be in focus at the same time, the camera needs to be as close to the back of the Questar as possible and we need to extend the eyepiece above its normal position. How difficult this is depends on the eyepieces that you want to use and on the camera flange to sensor distance - the shorter the better. Most planetary cameras should be relatively easy, mirrorless cameras will require a bit more eyepiece extension, and DSLRs will require even more. The camera flange distances in the note on adapter lengths may be helpful. The figure above shows some of the extenders that can help. Most of these are designed for slip fit eyepieces with standard filter threads. If you want to use a Questar/Brandon threaded eyepiece, the Vernonscope 1.25" filter adapter is essential. It a bit of extension itself and adapts standard filter thread eyepiece barrel extenders to screw on the Questar eyepiece. 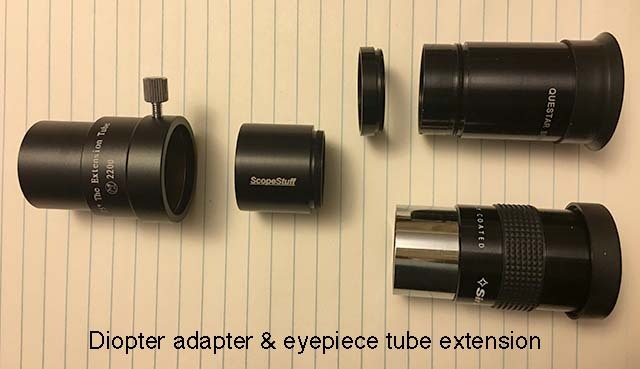 Slip fit eyepiece holder extenders make it easier to use multiple eyepieces with your camera. Parfocal rings could be used on a dedicated eyepiece. I use a 1" slip fit eyepiece extension tube and a 25mm plössl slip fit eyepiece, with my mirrorless Sony a6300 camera. With the Questar swivel adapter, 14mm medium extension tube, and a 3mm thick E-mount adapter, I have perfect focus for both the eyepiece and the camera. The finder focuser allows limited adjustment of the eyepiece focus. The finder is too far out of focus to be useful without swapping in a normal eyepiece without the extender. The exact configuration depends on the camera and eyepiece that you use and will require a bit of experimentation. The ability to move off target for easy focusing and have the target in perfect focus in the eyepiece and camera is well worth carrying a couple of additional parts for me.